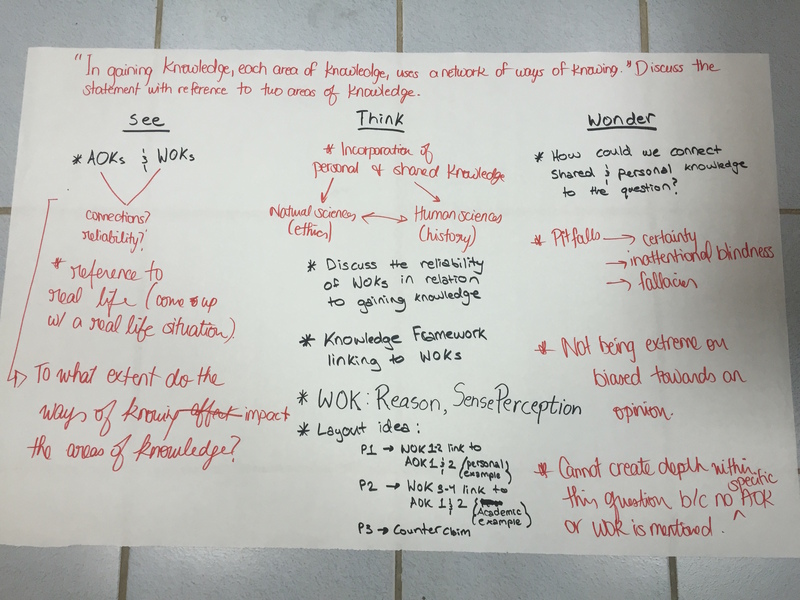 “In gaining knowledge, each area of knowledge uses a network of ways of knowing.” Discuss the statement with reference to two areas of knowledge. “Without application in the world, the value of knowledge is greatly diminished.” Consider this claim with respect to two areas of knowledge. “In knowledge there is always a trade-off between accuracy and simplicity.” Evaluate this statement in relation to two areas of knowledge. When I initially saw these prompts I thought to myself, wow! The prompts students are asked to write on are hefty. It is my first year teaching TOK and maybe I am naive to it all, but I am still amazed at what students are asked to think about. As a teacher and a learner myself, I had to take some time to unpack these questions, make meaning, and create understanding. I wanted to really think about each of the prompts and what they were asking. By unpacking the prompts myself, I hoped that I could help to support my students as they selected the prescribed title of their choosing. Due to time constraints and holidays at the school where I am, my students did not have the luxury that I did to slowly pick apart the TOK essay prompts. In order to help them think about about what prompt they would want to select for their essay , I utilized a Harvard Project Zero Visible Thinking routine. Specifically, I used the See-Think-Wonder routine. According to the project Zero website, See-Think-Wonder “encourages students to make careful observations and thoughtful interpretations. It helps stimulate curiosity and sets the stage for inquiry.” For me this was perfect. I wanted students to unpack these questions while interpreting and wondering so as to set their stage for both inquiry and for essay success. Often times Visible Thinking routines are associated with elementary or middle school learners. I am one that would strongly advocate the use of these routines at the high school level. 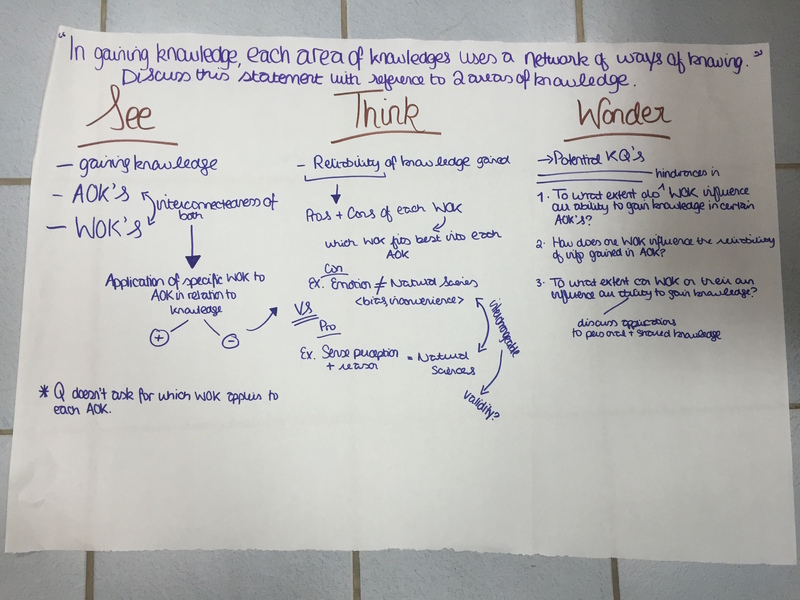 As my students used this Visible Thinking routine, they discovered and created very complex ideas and connections that will aid them in their selection of a TOK prompt, in completing an outline, and hopefully in the writing of their essay. Overall I was very happy with how this Visible Thinking Routine allowed my student to make meaning of the prompts in a simple, clear, and uncomplicated way. With the structure of the routine to keep them on track students were able to work together collaboratively to unpack ideas, support each other, and even challenge one another in their understanding of the prompts. What is also great, is that rather than having these ideas be vocalized and then forgotten as they head to their next class, students produced visual representations of their thinking that they could refer back to later as they jumped into essay writing. Why do I think that this exercise was relevant to my students on a greater level? These are all students that intending to go to university next year. They will undoubtedly be given questions and tasks that they find confusing or overwhelming. I would like to think that this exercise could be relevant to them because now they have been given a simple and straightforward tool to approach and unpack complex tasks. Instead of reacting to challenging assignments in a negative way, these students have three clear questions they can ask to provide clarity and make sense of their own thinking. What do I see? What do I think? What do I wonder? Three short questions that can provide such depth and understanding.